A slight chance of showers between 2am and 3am. Cloudy, with a low around 43. North wind 6 to 11 mph, with gusts as high as 18 mph. Chance of precipitation is 20%. Cloudy, then gradually becoming mostly sunny, with a high near 58. North wind 14 to 18 mph, with gusts as high as 34 mph. Mostly clear, with a low around 37. North wind 10 to 15 mph, with gusts as high as 30 mph. As part of our Board of Education's vision for the District and subsequent strategic plan, goals have been identified in key areas including the area of District and Community Relations. One of the goals in this area is "utilizing enterprise technology programs to enhance communication with the entire school community." Please see an overview/update provided below regarding this important goal. *We utilize an automated alert system for emergency situations and for outreach communication. *Our website has been updated in 2017 and again in 2019. *The District App has now been released, which is accessible in the Apple and Google/Android App stores. *The District is continuing to utilize a Facebook "closed" group for the District's most current updates, pictures, video clips, and highlights. Facebook can be accessed through the App, but only after you log in at least once in your Facebook account. Due to the fact that we are a "closed" group, a notification does not occur through the app when a post is made in our "closed" group via Facebook. *We are planning to pilot a Facebook "live" event this year, and then explore the possibility of making other public events accessible via Facebook "live." *Through the District app and our website, access exists to our District calendar, staff directory, parent portal, menu, Board of Education business, bus stop link, IL epay, news, Twitter page, menu, and notifications. Everybody who uses the app will automatically receive notifications as we are only utilizing one group for messages via the app. Remind and ClassDojo are accessible via the District app as well. Please note that our Twitter page is "open" and is primarily utilized for informational purposes only since it is an "open" feed. *The Technology Committee is considering a recommendation that the District move to universal communication systems next year for class-home connections (possibly ClassDojo) and for athletics/activity updates (possibly Remind). No official decision on this has been made, but the goal is to become more universal across the District for efficient and easy access for everyone. While we strive to be on the cutting edge and diversified in regards to communication, it can be cumbersome to keep track of all the different communication systems. Again, we will continue to work on coordinating and organizing these options to make communication easy and efficient for everyone. *Monthly Superintendent Shout Out sessions have been added this year. These monthly videos highlight the District while providing a recap of our Board of Education's monthly business. *Board of Education.......our Board believes in communication and transparency. Please note that nearly all board business can be found via this linkhttps://v3.boardbook.org/Public/PublicHome.aspx?ak=1001314. This link is accessible via our website, and it will also be available on our app as well. *As part of our Board's recent self-evaluation process, it was determined that a biannual newsletter will be sent out to the entire community. This first newsletter will be sent out before the end of Spring. *Some initial discussion has occurred about setting up a District YouTube Channel. This possibility will be explored further in the future. I am grateful for the vision provided by our Board of Education of transparency, being communicative, and striving to be on the cutting edge of education. When our community and school stay informed and connected, everyone benefits, especially our students. If you have any questions or concerns, please do not hesitate to contact me at 309-346-3182 or mgordon@rankin98.org. Go Rebels! Join Rankin School District #98's Facebook Page! 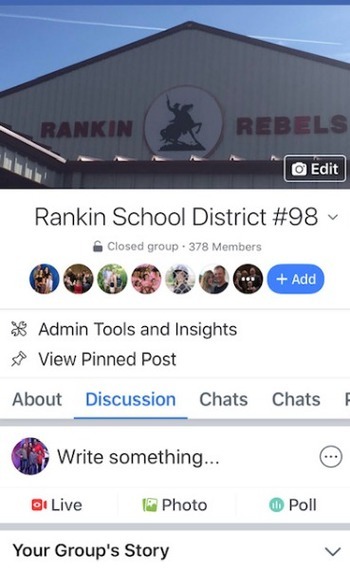 *Join Rankin School District #98's Facebook Page today (access pictures, videos, updates, information and more throughout the school year). Go to www.facebook.com and search "Rankin School District #98" and request to join! Find us on Twitter at @RankinRebels98! Parent Portal- Common Goal Systems, Inc.